Introduced in 2017 and with the first ever full-length EVERUN midsole, the Freedom ISO is a performance running shoe in every sense of the word. 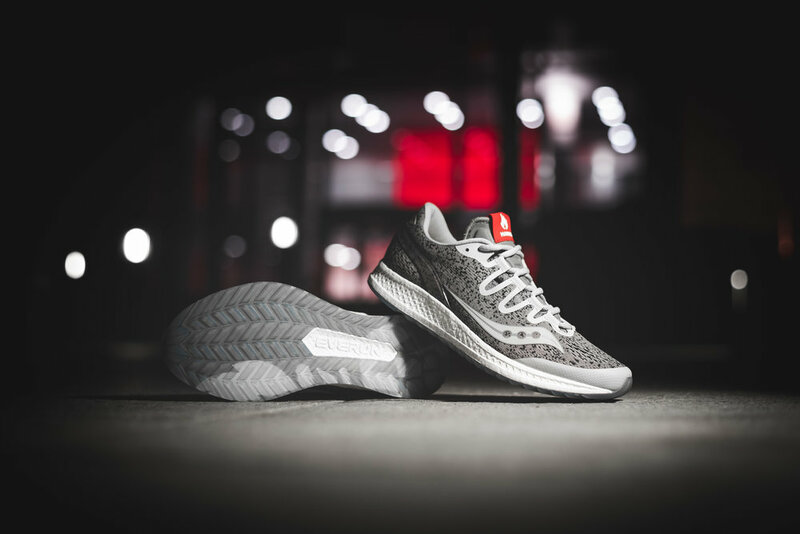 Named after the 1983 Freedom Trainer, the lightweight Freedom ISO sets itself apart with its predominantly one piece engineered knit upper, impressive integrated lace-loops and unique logo placement. Our aim was to create a performance running shoe which would bridge the gap between lifestyle and performance. Something that could be worn casually every day but also run a marathon in. So to achieve that, our HANON x Saucony Freedom ISO which weighs in at only 255 grams and features EVERUN topsole construction has been specced with performance driven materials throughout. Putting further emphasis on the tech, the ISOFIT dynamic system is integrated into the upper for a secure fit, and fused laminate details can be found on the toe bumper and lace-loops for support, with a hard TPU pieces on the rear to act as a heel counter. Paying homage to our hometown of Aberdeen which is often referred to as ‘the Granite City’ as many of the city’s buildings incorporate locally quarried grey granite, we’ve applied a dark grey granite print with a dark fleck to the breathable upper. To add contrast, we’ve executed the fused synthetic laminate on the lace stay and toe in a light grey which emphasises two parts of the shoe which are integral in its design. Attention to detail is applied via injection moulded HANON branding on the fiery red comfort suede tongue tab, dual branding on the heel tab and special collaborative branded insole. Reflective detailing is an important component of any running shoe and has been applied to the Saucony logo on both the lateral and medial side of the shoe, as well as the branded heel tabs. Our Freedom ISO sits atop a clean white full-length EVERUN midsole contrasted by a blue tinted TRI-FLEX crystal rubber outsole with HANON Torch logo spanning across both shoes. The HANON x Saucony Freedom ISO ‘Granite’ has been manufactured to a strict edition of 218 pairs and this shoe will be sold only by HANON from November 3rd 2018. The raffle for this release will close on Friday 2nd of November at 00:01GMT and then we will notify those who are successful in the raffle from 12:00GMT. There will also be an in-store release for the HANON x Saucony Freedom ISO ‘Granite’ on Saturday 3rd of November from 10:00GMT. Each pair will come in a custom all over print box with dustbag, bespoke tissue paper, and three lace sets.